Neuköln (Philip Glass, “Heroes” Symphony, 1997). I found I didn’t have a very good relationship with the sax and that lasted right the way through. We’re sort of pretty embittered with each other. It lies there waiting for me to touch it. It defies me to (laughs). I really have to go through traumas to get anything out of it that has anything to do with what I want it to say. So it’s not a steady relationship; it’s not a good one. David Bowie, 1983 (“Bowie’s Saxophone Struggle,” Steve Weitzman, Musician). David Bowie began as a saxophone player: it was his only role in his first band, The Konrads, and he plays sax on his debut single, “Liza Jane.” Bowie as saxophonist is a minor theme of his professional life, but it’s a consistent one—Bowie plays the brief, melancholy solo in the coda of “Changes” as well as some of the sax on Let’s Dance. Yet Bowie also knew his limitations on the instrument, which he had never mastered and which he would abandon for years (especially in the late ’60s). He sometimes brought in a pro when a song called for prominent saxophone, like David Sanborn (“Young Americans”) and Ken Fordham (much of Aladdin Sane). “Neuköln” features one of Bowie’s most ambitious saxophone performances, and the determination of Bowie’s playing here comes as a surprise (Bowie later called it his favorite sax performance on record). After Bowie’s two warm-up runs on sax, it seems as though the pattern of the track is settled, with Bowie’s sax serving as an occasional counterpoint to Eno’s synthesizer patterns (which at the start suggest his “Big Ship” and his work with Cluster), some of which are echoed by a three-note guitar line. Then (@ 2:45) Bowie begins an extended solo that continues for the remainder of the track. While at first submerged in the mix, the sax builds up steam until (around 3:50) Bowie erupts into a series of shrieking runs inspired by Ornette Coleman or late John Coltrane. Bowie’s sax closes out the track alone, with two wailing falling lines that call back to the faintly mournful synthesizer heard at the start of the track. During the Ziggy Stardust era, Bowie’s sax playing had been bent on imitating the sound of early rock & roll players (Bowie aiming for the massed-horn sound of Little Richard’s band on tracks like “Watch that Man”) or of R&B/jump bluesmen, with the fat-toned Earl Bostic a primary influence. On “Neuköln,” though, Bowie wanted to go avant-garde, but the limits of his technique and of his allotted time compromise the power of his playing—it’s startling but has no real depth. As with its sisters “Sense of Doubt” and “Moss Garden,” “Neuköln” is built around oppositions: here Bowie’s squawking against a static wash of synthesizers. And as with the other instrumental tracks, there’s also a feeling of dilettantism to it. Bowie titled “Neuköln” after the southeastern Berlin neighborhood mainly populated by Turkish gastarbeiters (Bowie dropping an “l” from the name*). This created a persistent myth that Bowie had lived in the neighborhood—he lived in Schöneberg, though to be fair, it’s not that far from Neukölln. And Bowie later claimed he had used a “Turkish modal scale” for his performance,** which makes its sequencing into “Secret Life of Arabia” both fitting and slightly ridiculous. So several critics have found “Neuköln” to depict the isolation of Turkish immigrants in a harsh city that used them solely for labor, or a musing on Islam in the West (Bowie’s sax does appear to imitate a muezzin call at times), or the fate of a faceless, nameless individual living in the cradle of the Cold War. All of these theories could well be true, and the image of a stateless traveler would be central to Bowie’s next record. But the speculations are also a testament to the brute power of naming. Had Bowie instead called the track “Tiergarten,” would it now be considered a rumination on Nazi persecutions, some veiled depiction of Rosa Luxemberg’s murder? A single word creates worlds. * The misspelling led to speculation that Bowie was actually referring to the band Neu! and the city of Köln, but it appears to have been just a spelling error on Bowie’s part. ** The only clue Bowie gave as to what this scale was came in a 1983 interview, where he mentioned that the scale had “whole notes where one could take a half note,” suggesting it’s likely the Phrygian dominant scale or some variant. 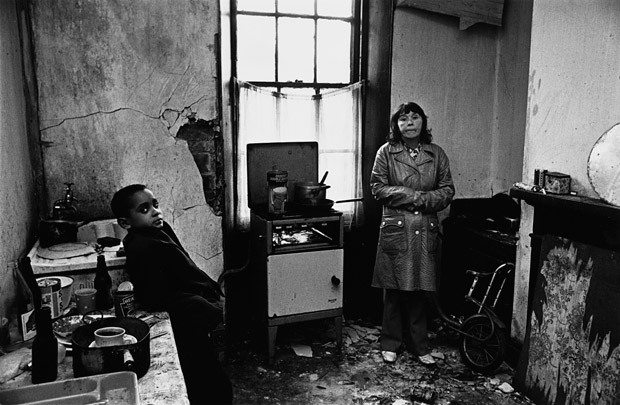 Top: Don McCullin, “Mother and Son, Bradford,” 1978. This entry was posted on Thursday, May 26th, 2011 at 10:31 am and is filed under "Heroes": 1977. You can follow any responses to this entry through the RSS 2.0 feed. Both comments and pings are currently closed. I love Bowie’s slouchy Rock n Roll sax as featured on Tiny Girls but this?? The problem is Bowie aspiring to being avant garde in a very cliched way. Probably professor ENOs fault; he was trying so hard to impress him. One of the best ‘ambient’ soundscapes produced and perhaps the most affecting. It is a chilly and melancholic piece in which Bowie’s bleating drone acts as the bleak scene setter and eventually becomes the lone voice …superb stuff and I feel should have closed the album. Best pieces by bowie and eno I meant to say. This one is ruined for me by Bowie’s dissonant sax at the end. I’m a fan of free jazz but this just doesn’t work. I agree with Gnomemansland that he’s just trying too hard. The Tiergarten remark reminded me of Tangerine Dream’s “Le Parc,” released in 1985. They have a piece titled “Tiergarten,” which is followed by “Zen Garden.” Coincidence? I really love the sax in this one. I’ve always (very freely) interpreted the instrumental tracks on “Heroes” as signifying some dystopic urban decay and doom, maybe with some war in there (with the harsh sounding airplane sounds in Moss Garden and V2-schneider and references to V2s etc). I think the saxophone in the end of Neuköln sounds so desperate, like a last cry for help, from some dystopic version of Neuköln. I also think Neuköln reminds me a bit musically of the very short “future legend”. A song with a clear definite urban dystopic theme. Also Warszawa comes to mind. I also think that you are pretty spot on with your interpretation. “…a testament to the brute power of naming.” ,,,bravo, there. I think the sax at the end sounds like a baby wailing. Don’t know how that would fit in with everything else, mind. I find Neuköln interesting when it’s placed in context of what Bowie was doing at that time. In June he’d finished Lust for Life with Iggy Pop after the Idiot tour and they went to France where Bowie promoted Low. In July he went on holiday to Spain and so when he came to record the ”Heroes” album he was likely in a relaxed and happier mood than he’d been for a long time. He’d probably been spending evenings at Chez Romy Haag and liked the idea of recreating the decadence of early 20th Century Weimar Berlin. Neuköln always makes me think of that era in smoky cabaret halls, the art scene and the glamorous nightlife. We know that the album was recorded over the first 3 weeks of August 77, it’s also worth remembering that Elvis died during that time. He’d apparently asked Bowie to produce his next album a few months before. Although you don’t hear it literally in the music, his death must have been in Bowie’s mind and I have thought before that the almost desperate sax could be about that, the end of the rock and roll era for Bowie, rather than (or as well as) the Neuköln district and the Turkish population which is what’s often thought of. (Though this is very tenuous, as the actual dates of each song aren’t known). Bowie loved the sax, he said it was his way of ‘getting to America’ and a ‘symbol of freedom’ for him when he was younger (though he didn’t think he played it well) and It’s worth remembering that the one item he wouldn’t release to the V & A was the Bakelite sax which his father bought him when he was a kid. Finally, I think Bowie played a game with us – after the misspelling of Neuköln, years later in Where Are We Now he misspelled Potzdamer Platz (s/b Potsdamer). Rather than a typo, I like to think he was enjoying reminiscing and it was deliberate! A Bowie word-play! So based on the context, I think Neuköln probably meant more to Bowie than just as an instrumental towards the end of the album.